In this tutorial we are going to build a Twitter clone using Django and GetStream.io, a hosted API for newsfeed development. We will show you how easy is to power your newsfeeds with GetStream.io. For brevity we leave out some basic Django-specific code and recommend you refer you to the Github project for the complete runnable source code. At the end of this tutorial we will have a Django app with a profile feed, a timeline feed, support for following users, hashtags and mentions. I assume that you are familiar with Django. If you're new to Django the [official tutorial] (https://docs.djangoproject.com/en/2.0/intro/) explains it very well. We will use Python 3.6 and Django 2.0, which is the latest major release at the time of writing. Make sure you have a working Django project before you continue to the next part of the tutorial. stream_django provides the GetStream integration for Django, it is built on top of the stream_python client. In this application we will have three different models: users, tweets and follows. To keep it as simple as possible, we will use Django's contrib.auth User model. Have a look below at the initial version of the Tweet and Follow models. Now, let's create the schema migrations and apply them. Let's also setup the view to add tweets. Now that we have the view setup for creating tweets we can move on to setting up the newsfeed. We want the tweets to be stored in the authors feed. This is when we start using the stream_django integration. We can configure the Tweet model so that it will syncronise automatically with feeds. From now on, new tweets will be added to the user feed of the author and to the feeds of all his followers. The same applies to deleting a tweet. We've now created our first Tweet, and in turn added an Activity to a Feed via the Stream API. By default, stream-django creates and adds the Activity to a feed named after the 'actor' property. This can be customized by overriding the _attr functions inherited from the stream_django.activity.Activity mixin on the Django Model. Now, this is the first time we talk about Activities and Feeds, let's take a moment to define what an activity is. GetStream.io API's allow you to store additional fields in your feeds, as you can see from the documentation here. 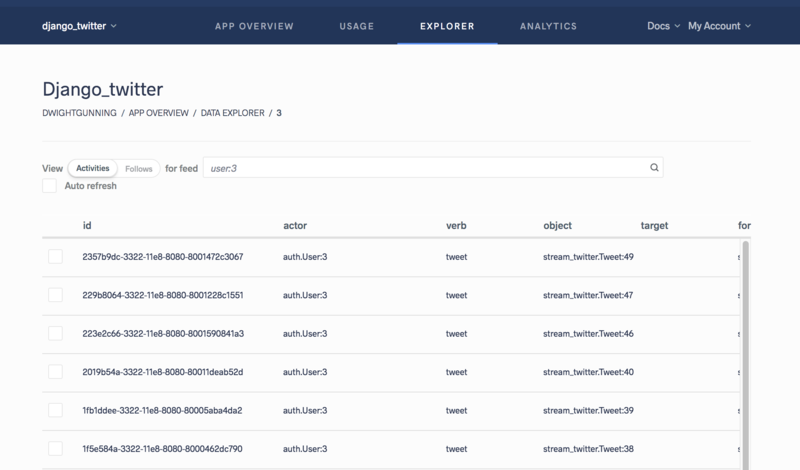 We can verify that the Activity was added by using the Data Browser in GetStream.io's Dashboard. So now that every tweet gets stored in the author's feed, we are going to add a view that reads them. There are two new things that I should explain: the feed manager and the enricher. As the name suggests, the feed manager takes care of managing the different feeds involved in your app. In this case we ask the feed manager to give us the user feed for the current user. As you can see, 'object' field does not contain the tweet itself but a reference to that (the same applies to the 'actor' field). The enricher replaces these references with model instances. django_stream comes with a templatetag that helps you to show the content from feeds in your templates. This can get quite complex as you add different kinds of activities in your feeds. The first time you run this, Django will complain that 'activity/tweet.html' is missing. That's because the render_activity templatetag inspects the activity object and loads the template based on the verb. Because the verb in this case is 'tweet', it will look for tweet.html in activity path. The templatetag accepts extra options to make your templates as re-usable as possible, see here for the templatetag documentation. As a next step we're going to add the ability to follow users to the application. To do this we create a view that creates Follow objects. Now we can use Django's signals to perform follow/unfollow requests on GetStream APIs. The hardest part for a scalable Twitter clone is the feed showing the tweets from people you follow. This is commonly called the timeline view or newsfeed. The code below shows the timeline. Now that we have parsed the hashtags, we could loop over them and publish the same activity to every hashtag feed. Fortunately there's a shortcut though. GetStream allows you to send a copy of an activity to many feeds with a single request. From now on, activities will be stored to hashtags feeds as well. For instance, the feed 'hashtag:Django' will contain all tweets with '#Django' in it. Again the view code looks really similar to the other views. Now that we found out about the activity_notify property, it only takes a bunch of extra lines of code to add user mentions. Congratulations, you've reached the end of this tutorial. This article showed you how easy it is to build scalable newsfeeds with Django and GetStream.io. It took us just 100 LoC and (I hope) less than one hour to get this far. You can find the code from this tutorial and the fully functional application on GitHub. The application is also running and can be tested here. I hope you found this interesting and useful and I'd be glad to answer all of your questions. If you're new to Django or GetStream.io, I highly recommend the official django tutorial and the getstream.io getting started. user = User.objects.all().first() return 'None'. Why is the app not being able to connect to my getstream dashboard? i have specified the api_key and api_secret correctly and it has users. I had to upgrade pip in order to get httpsig installed, otherwise pip wasn't finding a download for it. @snobear has it right... I had to update pip as well, or else httpsig wasn't found and loaded. Great tutorial though, thanks! 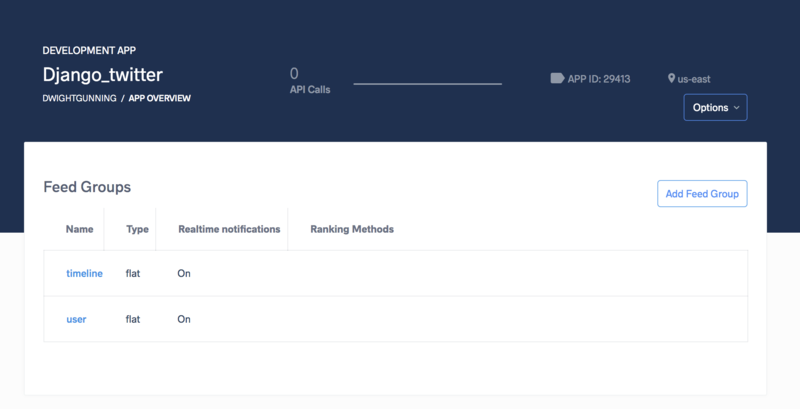 You probably havn't setup a user feed for your app in streamio. Go to dashboard http://getstream.io/dashboard/ and check. It also takes a few minutes for a new feed to be available. What would a retweet look like?